Few would question the importance of maintaining and promoting a highly skilled labor force. It does not take expert testimony to remind us of the importance of education, not solely in terms of prosperity and international competition, but also because of the innumerable and immeasurable benefits to society, families, and individuals when each of us has the opportunity to realize our potential. Congress has long appreciated the critical role of education in our society. One needs look no further than the formation of this very committee as a symbol of our determination to promote the critical goal of creating and promoting the most effective public policies to advance the role of education in our society and workforce. These assertions are so widely agreed upon by economists and policy makers that there is little need to present corroborating evidence. Suffice it to say that the evidence overwhelmingly supports the contention that all else equal, a more highly educated workforce is far more productive than the alternative. Such a workforce is also far more likely to generate the productive innovations that have helped build our economy to its world-class stature. Instead, this testimony will focus on three critical questions. Is there any evidence that the lack of skill is responsible for our current employment problems? Can the unusually weak jobs recovery be explained by the lack of skill or education of the American workforce? Is more education the most effective policy solution for Congress to offer to the recent challenge posed by the so-called “offshoring” of service sector, white-collar jobs? Is there evidence of a longer-term skills mismatch? Should our primary strategy for ensuring that our economy follows a strong and equitable path be that of enhancing educational opportunities? The answer to the first question is an unequivocal “no”—the weak jobs’ performance of the last few years is wholly a demand-side phenomenon. The problem is not the lack of skilled workers; it’s the lack of jobs. The second question is more difficult to answer, given that there is much that remains unknown about the magnitude of the offshoring phenomenon. However, the fact that advances in computing and telecommunication have created new and far less costly access to the large global supply of skilled, relatively cheap labor means that our skilled workforce now faces a level of competition from abroad that has heretofore largely befallen our blue-collar workforce. Anecdotal reports reveal a pay gap between skilled workers in this country relative to those in offshoring targets in the neighborhood of 8 to 1. For example, the Bureau of Labor Statistics reports that a programmer in Silicon Valley, an area particularly vulnerable to the offshoring of tech jobs, earns about $78,000 annually, including benefits. According to PayScale, a compensation information firm, the comparable job in India pays around $8,000. Other reports show pay gaps of a similar, or even larger, magnitude. What differentiates foreign workers from their domestic counterparts is thus less a skills’ gap than a gaping wage differential. By offshoring skilled and semi-skilled white collar jobs, US firms are sending a clear market signal that these offshore workers are worth the investment made by American firms. Note that throughout this recent period when offshoring concerns have surfaced, firms in affected industries, such as information technology and financial services, have been able to maintain historically high rates of productivity and profitability even while domestic hiring has stalled or fallen. Thus, while the extent of the phenomenon is unknown, it is highly likely to increase further, as will the attendant anxiety it generates among domestic workers in affected sectors. The policy question is: can such workers upgrade their skill sets to re-justify the large wage differentials that they currently enjoy? The answer depends on how high the “skill bar” gets raised by offshoring. If, for example, our radiologists, architects, and computer scientists are in need of skill upgrades, the bar may be set unrealistically high, and such workers could easily see their living standards decline. The answer to the third question—is there a skill mismatch between the jobs we’re creating and the labor force coming out of our schools—is also difficult to pin down. The conventional wisdom, such as that expressed by Federal Reserve Chairman Alan Greenspan in a recent speech, is that this is the case. But a closer look suggests that the case is not nearly so airtight. Historically, our education system has generally provided an adequate supply of skilled workers to meet employers’ skill demands, and lately, the supply of skill, along with its productive capacity, has accelerated. At the same time, while employers’ skill demands continue to increase apace, there is little evidence that such demands have accelerated. In fact, the knowledge of our skilled workforce in tandem with capital investment and technological innovation appear to have given rise to a new golden era of accelerated productivity growth. This may be a particularly surprising finding given the well-known growth in the skill premium, or relative wage, of college educated workers. The rise in their pay relative to that of less-educated workers has been taken as prima facie evidence that skill demands have been unmet in recent years, but for reasons discussed below, this variable offers only partial evidence of unmet skill demands. Our current, short-term labor market difficulties are by no means skill-related. Though the recession is behind us, we continue to suffer a protracted contraction of demand for labor. The practice of American firms outsourcing white-collar jobs to other countries poses a potentially huge new challenge for our labor force. While upgrading the skill sets of our workers relative to those offered by our trading partners may well be the way forward, given the height to which such a strategy raises the education bar, it may not be a very realistic policy solution. While it is widely accepted that our schools produce workers whose skills are not adequate to employers’ demands, the evidence for this contention is not strong. In fact, recent accelerated trends in American skill supply and productivity would suggest that no such mismatch exists. These conclusions should not, however, lead us toward complacency; our education system is by no means working perfectly. In fact, there are significant problems, especially in our K-12 system of public education, but these are largely distributional. Despite the fact that access to quality education is a basic American value, such access does not now exist for too many low income families in disadvantaged communities. that we are 27 months into a new recovery, the level of employment remains 2.4 million jobs down from the end of the last business cycle peak in March of 2001. Never before has it taken as this long to regain the jobs lost in a recession. Even in the last jobless recovery of the early 1990s, by this time employment had surpassed its prior peak by almost 900,000 jobs and we were adding over 200,000 jobs per month on average. The comparable figure today is 60,000. Economists have tried to explain the persistence of such a weak jobs recovery, particularly in the context of what has been fairly strong overall economic growth in recent quarters. While it is beyond the scope of this testimony to go into the details of these explanations, the prime candidate is faster productivity growth. As we at EPI have noted, this explanation is only partly convincing, given that productivity usually accelerates coming out of a recession (though more so this time). We offer other explanations, including slower demand growth than is usually the case at this point in an expansion, and employers’ increased reluctance to engage in permanent hires. However, the question for this analysis is whether the lack of skilled or highly educated workers is what’s holding back job growth. Here, the evidence clearly points to “no”—it is lack of jobs, not lack of skilled personnel. The problem is on the demand, not the supply side. Evidence for this claim comes from a set of indicators which profile the conditions of the labor market facing college-educated workers. Along with the overall group of college graduates, I also provide analysis of younger grads—age 25-35—as these workers offer the most direct evidence of the ability of our current labor market to absorb those workers with newly minted skill sets. The object of this analysis is to see if there is evidence of a skill shortage in the current labor market. For example, does the evidence support a claim made by an executive in a recent New York Times report, that the motivation behind the current wave of white-collar offshoring was not solely costs, but also the lack of available, capable American workers? A good proxy for the extent of labor market demand for a particular group of workers is the share of that population employed. 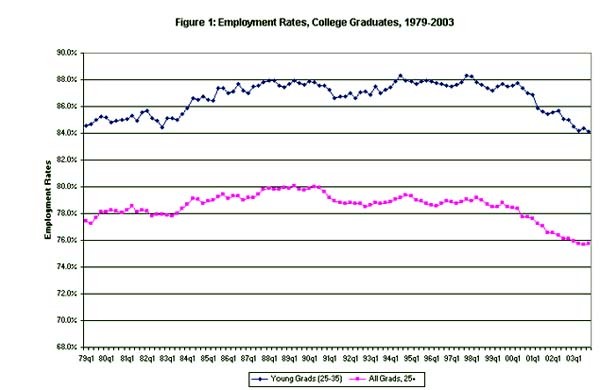 Figure 1 shows the trend in employment rates of all college graduates over 25 and young college graduates, age 25-35. In both cases, employment rates have fallen more steeply over the past few years than in any other period in the figure, dating back to 1979. By this measure, demand for highly-educated workers faltered in the recession of 2001 and has yet to recover. Declines in employment rates can occur if older workers retire or leaving the labor market for non-economic reasons. However, we would certainly not expect this to be the case among younger college graduates, who have every reason to stay in the market, tapping their newly acquired skills. In fact, as the figure shows, college graduates age 25-35 have employment rates that exceed those of overall college grads by about eight percentage points. As the top line in the figure reveals, their employment rates have tumbled even further than those of all college grads. 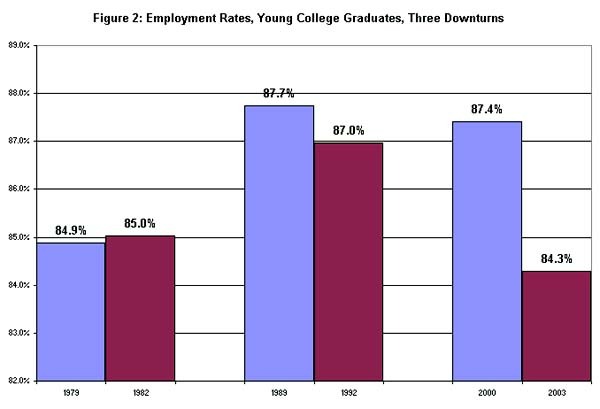 Figure 2 uses some of these same data on young college graduates to construct a comparison over three roughly similar periods in the business cycle, going from an economic peak to three years later. The figure reveals an important difference in the current period, as employment rates of young college grads are considerably further below their recent peak in this recovery than in the prior two. Clearly, this most recent period has been one of uniquely weak labor demand for workers with newly minted skills. 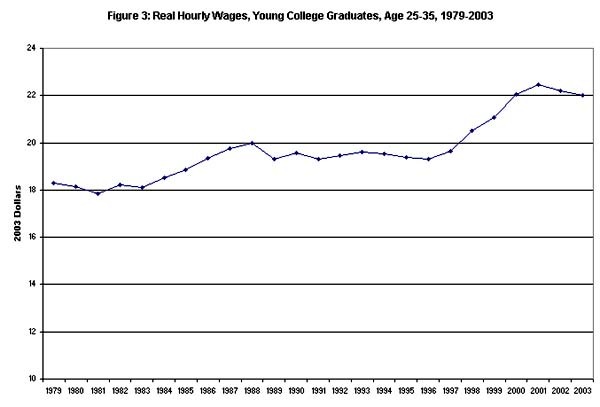 Figure 3 turns to the real hourly wages of young college graduates, those 25-35. Note that after rising about 10% through the mid-1980s, their wages were flat for the next ten years, before rising sharply in the tight labor market of the latter 1990s. However, the persistently weak labor market since 2001 took the momentum out of the series, and it reversed course in 2002 and 2003. The lack of demand for these workers grows directly out of the lack of job creation in fields that disproportionately employ them. A salient example is information technology, a sector where many young college graduates found employment over the last decade, and a sector that is also relevant to the offshoring debate. 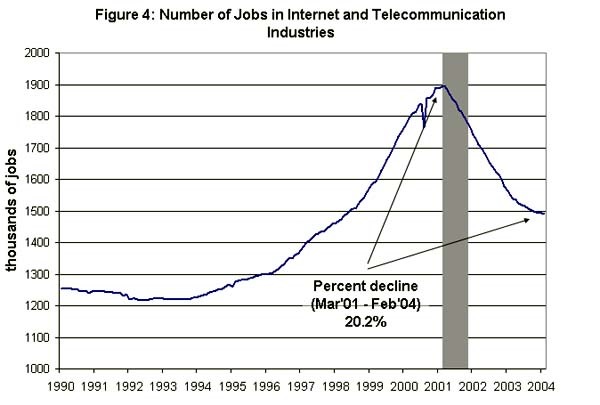 As shown in Figure 4, net jobs losses since 2001 been particularly steep. These results—net job losses, falling employment rates, along with a reversal of wage growth—strongly point to weak demand for our existing stock of college graduates, a stock that, of course, continues to expand. The data strongly contradict a skill supply-constraint interpretation. Offshoring and Skill Supply: Will the Skills Bar Be Raised Unrealistically High? As is now widely appreciated, technological advances in computing and telecommunications have combined to enable American firms from our service sector to increase the pace of outsourcing production tasks to other countries. A particular concern is the so-called “offshoring” of white-collar, skilled jobs, placing our advanced workers in direct competition with those who will do similar work for far lower wages. While the magnitude of this trend in unknowable at this point in time, anecdotal accounts strongly suggest the trend has recently accelerated. A rare academic study of the issue showed that between 2000 and 2002, job loss was greater in occupations vulnerable to offshoring, however, some of these losses—such as those in IT—are clearly related to weak cyclical factors in our economy. At any rate, given the difficulties in the current labor market for highly educated workers, it is reasonable to ask if these two trends are related. Is increased outsourcing of white-collar jobs partly responsible for the weak job market for college graduates, along with the very slow employment gains in industries such as IT? Again, since the extent of offshoring white-collar jobs is not known, we cannot provide a conclusive answer to the question of its role in the weak recovery. One media account suggests that 10% of the over two million net job loss since the recession might be attributable to offshoring, and while this is pure guesswork, it is not implausible, though it may represent an upper bound. ring. Also, the fact that the timing of the above-noted difficulties faced by college-educated workers corresponds to what appears to be an acceleration of the offshoring trend has led many observers to “connect the dots” between these phenomena. A more tractable question is: to what extent is education and training a viable solution for the problem of offshoring white-collar employment, regardless of its magnitude? It is notable that this same solution was and is offered to manufacturing workers displaced by the increase in global trade that has in part led to a very significant diminution in blue-collar jobs over the past decade. Throughout the 1990s, these workers were told to train for expanding industries, such as IT, that were thought to be less exposed to global competition. The fact that such service jobs can increasingly be outsourced provides a whole new set of challenges to our workforce and our economy. Still, the recommendation to displaced blue-collar workers to learn new skills commensurate with the evolving economy made sense for two reasons. First, it suggested labor movement from a contracting sector—manufacturing—to an expanding one: services. Second, it reasonably suggested that displaced blue-collar workers needed a new skill set for jobs in services that most often had quite different requirements than factory work. But does this policy solution also make sense vis-à-vis the challenges posed by offshoring of service employment? With global competition in manufacturing, our less-skilled workers were placed in competition with less skilled workers from countries with far lower earnings and similar value added. Our comparative advantage, it was argued, was both our large relative stock of skilled workers, and our greater ability—relative to our competitors—to produce an increasing flow of such workers. However, some less developed countries have been sharply increasing their own supply of skilled workers, meaning that offshoring has the potential to vastly increase the global supply of skilled labor, eroding our comparative advantage both in terms of stock and flow. Comparing data from our education statistics and to a recent report from an Indian IT association provides an instructive example. India is adding about twice as many college graduates to its workforce per year as we are (1.2 million in the US versus 2.5 million in India). Of these Indian graduates, over 250,000 were “engineering degree and diploma holders” in 2002 compared to 70,000 bachelor’s degrees in engineering awarded here. What’s more, the 2003 entering class for Indian engineers is reported to be 375,000, a large jump suggesting that the Indian population is responding to the market signal of forthcoming global demand in this field. This supply shock threatens to significantly depress the earnings of skilled workers here, who enjoy a very substantial wage advantage over workers with similar skills in less-developed economies. Anecdotal reports reveal that the pay gap between skilled workers here and those in offshoring target countries is in the neighborhood of 8 to 1. For example, the BLS reports that a programmer in Silicon Valley, an area particularly vulnerable to offshoring of tech jobs, earns about $78,000 annually, including benefits. According to PayScale, a compensation information firm, the comparable job in India pays around $8,000. Office Tiger, an Indian financial services firm, also reports an 8/1 ($96, 000/$12,000) pay differential between American and Indian financial analysts. Another comparison, from the Financial Times, reveals a that US architects are paid about 10 times that of those in Vietnam (about $60,000/$600 per year). Employers have argued correctly that the costs associated with outsourcing, such as language differences and lack of personal contact, reduce the labor-costs savings generated by this large gap. But by stepping up their outsourcing activities, they are sending a clear market signal that these skilled workers abroad are a better value than those whom they are replacing at home. The education solution then amounts to an effort to increase our skills even further, to engage in ever-higher value added work that can support existing wage differentials even in a global job market with far more skilled workers available than were available to American firms just a few short years ago. The plausibility of this endeavor depends essentially on how high the bar is raised. If, for example, as has been reported, our hospitals and tech firms outsource radiology and programming jobs to low wage counties, are we to assume that radiologists need a better skill set? Such reasoning has an undeniable logic until we realize these persons are already among the most highly educated in our country, if not the world. To contemplate the notion that they need to re-skill raises the education-requirements’ bar to a level far above that which we’ve ever contemplated in this debate. An important piece of information in this regard is how high up the skills’ chain do these offshored jobs reach. The evidence, largely anecdotal at this point, is mixed, with reports of both low- and hi-tech jobs being outsourced. While the offshoring of lower wage/skill, back-office operations, such as billing, claims’ filing, and tech support, has been widely reported, anecdotes abound regarding higher-end jobs, from Ph.D. level financial analysts to architects, radiologists, and software engineers. Over the Longer Term—Are We Producing Too Few Skilled Workers? No serious analyst could question the value and importance of a skilled workforce. Years of economic research has established that an increasing supply of skilled workers is a critical input into production, leading to higher productivity growth and better living standards throughout the economy. In addition, the great innovations that have helped to establish our world-class economy are clearly linked to the quality of our workforce. Yet, many critics of the American education system, particularly K-12 public schooling, argue that we fail to produce enough skilled workers to meet employers’ demands. For many labor economists, the most convincing evidence of this claim is the fact that over the past few decades, at the same time the share of college graduates in the labor force was increasing, the ratio of their earnings to those of less-educated workers also grew. If demands for skills were adequately met, so this argument goes, percentage wage gains should have been roughly equal between college grads and less educated workers. However, there are a number of reasons to question the too-readily accepted notion of a skills mismatch in our labor market, either now or in the future. These counterarguments are discussed at length in various papers cited below, and are only briefly presented here. There are other explanations for the increase in the college wage premium. As discussed in Mishel et al, 2002, the rise in the college premium has been partly driven by shift in economic structures that have served to lower the wages of less educated workers, such as the loss of manufacturing jobs, fewer unions, lower minimum wages, and, excepting the latter 1990s, high average unemployment rates. Regarding this last point, note that the skill premium grew much less quickly in the 1990s as in the 1980s, despite the fact that the latter decade arguably should have seen greater skill demands due to the accelerated dispersion of technology. But tight labor markets—a demand side factor—led to faster wage growth for the less skilled. p. Refer back to Figure 3 and note that for about 10 years, from the latter 1980s through the mid-1990s, the real wages of young college graduates were flat. Their premium may have been rising over this period, but as just noted this was partly due to the structurally-induced decline in wages of less-educated workers. Presumably, a true skills shortage should lead to rising absolute wage levels, not simply relative wage gains. Occupational employment shifts show steady, not accelerating growth of skill demands. It is critical to note that skill demands have always risen over time and will continue to do so. However, the “skills mismatch” claim argues that the rate of skill demands has increased. In Bernstein and Mishel (2001), we present an index of occupational skill demands and show that it has proceeded at a steady pace over the past 25 years. BLS occupational projections do not imply an acceleration of skill demands in the future. Recent projections of job growth by occupation do not paint a picture of difficult-to-meet skill demands. While most of the fastest growing occupations call for at least a college degree, these occupations are growing from a low base and are thus not contributing the most jobs to the future economy. Conversely, of the 30 occupations adding the most jobs over the next decade, only eight call for a college degree. These occupations are expected to add 12.6 million jobs over the next decade, and only 30% are expected to require at least a college degree. At the same time, the quality of our labor supply has increased significantly. We have doubled the share of college educated workers, including those with advance degrees, from 14.6% in 1973 to 29.1% in 2003. Conversely, we have cut the share of high-school dropouts from 28.5% in 1973 to 10.6% in 2003. Our workforce has become more productive over time. This often overlooked point poses a serious challenge to the skills-mismatch position and is discussed in more detail. Not that not only has the quality of the US labor force increased over time, but the growth rate of labor quality has accelerated. Figure 5 plots two indexes of labor hours from the BLS’s productivity accounts. One series is the usual hours series from the labor productivity accounts, and the other is adjusted for skill—primarily education and experience—from the multifactor productivity accounts. Note that the two series grow at the same rate until the late 1970s, implying that the quality of labor was growing no faster than hours worked and thus was not an accelerating factor in the growth of labor productivity. 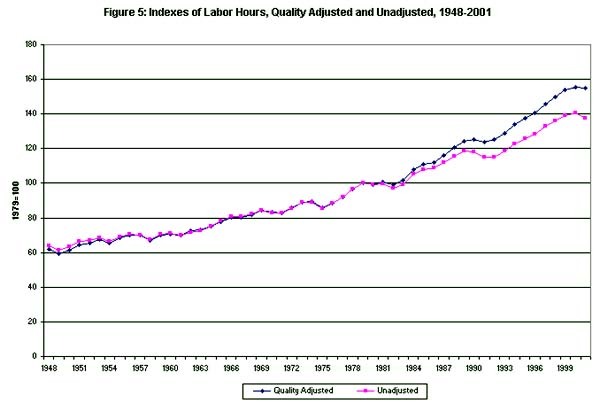 Post-1979 however, the quality adjusted hours index grew about 0.5% per year faster than the unadjusted index, implying that labor productivity growth was receiving an added boost from the improved education and experience of our workforce. This final point, in tandem with recent dramatic productivity gains achieved by our workforce poses a challenge to the skills-mismatch argument. Along with rising wage differentials, it is common for proponents of the argument to present test score data showing our students performing poorly relative to those in other countries. While such findings are surely worthy of concern, a better outcome measure is simply the productivity of our workforce. By this measure, we are performing quite well in historical terms. Trend productivity growth accelerated by about 1% per year in the latter half of the 1990s—from 1.5% to 2.5% per year—and has accelerated about another 0.5% since then (though many experts suspect that this added boost is less sustainable). Contrary to a skills deficit story, the acceleration of this most important economic indicator suggests that the knowledge of our skilled workforce in tandem with capital investment and technological innovation appear to have given rise to a new golden era of accelerated productivity growth. This latter discussion should by no means be taken to imply that our education system is problem-free, or that every student is given the opportunity to realize his or her potential. In fact, it is in this arena of the distribution of educational access and quality that clear and very serious problems exist. The goal of ensuring access to a quality education for all continues to elude us as a nation. Realizing this goal must be a central purpose of education policy. But this is quite a different conclusion than one which implicates the system as a whole in failing to meet the demands of work now and in the future. As I have argued, there is simply no credible argument that our short term labor market weakness is skills-related. The problems right now are on the demand side, specifically lack of job creation. In fact, the share of non-employed college graduates is at a 25 year high, suggesting ample supply of skill in the short run. In the medium term, the offshoring of white-collar jobs poses a serious threat to our skilled work force. While evidence is sketchy regarding the extent of the phenomenon, it seems quite clear that technological advances have lowered the transaction costs of bringing potentially millions of skilled workers from low-wage countries into the global labor market. More to the point, many of these workers appear to have comparable skills to our own and will work for compensation that is 1/8 or even less of domestic workers’ compensation. An education solution to this problem suggests that our skilled workers need to upgrade their skill sets further to “re-justify” the existing compensation gaps. But given the fact that some of our workers affected by offshoring are among the most skilled in the country, if not the world, this solution may not be realistic. Thus, we must focus not only on the supply-side as in skill-based policies, but must also consider policy solutions for creating jobs in the United States and keeping existing jobs here. Examples of legislation that might help in the short-run include: changing government procurement policies to prohibit contracts from being performed overseas unless necessary, eliminating tax deferral of profits earned abroad, and closing other tax loopholes that encourage, and even subsidize, companies to ship jobs overseas. Funding government-sponsored infrastructure, such as the Transportation Bill currently under discussion, has the potential to directly create employment, and increasing our investment in research and development will further promote the technological innovations that have been so critical to advancing our economy and providing new opportunities for our highly-educated workers. domestic job opening that went overseas, would have no way of knowing). A simpler approach would be a broader tax on any service imports, with revenues dedicated to providing a better safety net and training resources for unemployed workers. Though I have argued against the existence of a widespread skills mismatch in our labor market, there are many who could readily benefit from education and job training. It is notable and distressing in this regard that the Administration’s FY 05 Budget does not make existing education and training programs a priority, but instead proposes significant cuts in their funding. In the spirit of today’s testimony, not only should Congress increase funding for existing programs, it should expand these programs—such as extending the Trade Adjustment Assistance Act (TAA) to cover service workers, providing more generous tax credits for health care premiums under TAA, and extend unemployment insurance benefits for the long-term unemployed who have exhausted their regular state benefits. This latter idea is particularly relevant given that the weak pace of job creation in the current labor market has led to 20-year highs in the share of unemployed workers jobless for at least half-a-year (22.9% last month). Finally, the problems of the economy and outsourcing of jobs do not take place in a vacuum, but are intricately linked to other social issues. Long-term policy avenues should also be considered, such as improving access to the health care system to both keep employers’ costs down and to ensure that laid off workers maintain health insurance, ensuring that all trade agreements have adequate and enforceable labor and environmental protections built into the core of the agreement, and coordinating multinational efforts to devalue the dollar against Asian currencies to boost exports and regulate the United States’ trade imbalance. technology story of U. S. wage inequality.” In Berg, Ivar and Kalleberg, Arne. I. eds. Sourcebook of Labor Markets: Evolving Structures and Processes. New York, New York: Kluwer Academic/ Plenum Publishers. America, 2002/ 2003. Ithaca, New York: Cornell University Press. Jared Bernstein is a senior economist at the Economic Policy Institute in Washington, D.C.